The Tuggeranong Bulldogs Junior AFL Club, which will this year celebrate its 40th season, is almost as old as Tuggeranong itself. The club was started in 1976 (the result of the South Woden AFL Club moving even further south), just two years after the first families moved into the suburb of Kambah. 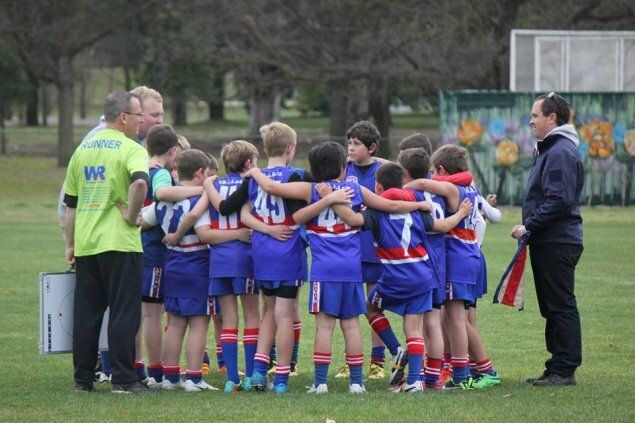 Its senior teams eventually split to form what would one day become the Tuggeranong Hawks, which is now the feeder club for junior clubs including the Tuggeranong Bulldogs, Tuggeranong Lions and Calwell Swans. President Richard Asher first played for the Tuggeranong Bulldogs in the seventies, but has been involved as a parent since his eldest son started playing Auskick in 2001. This is his second year as president, and he says he enjoys being involved with a club that has a strong community focus. “This is a really good family club. It brings people in, it’s a friendly environment,” he says. Tuggeranong Bulldogs Junior AFL Club counts Aaron Hamill (Carlton and then St Kilda), Justin Blumfield (Essendon) and Jason Tutt (Carlton) among its former players. And while Richard says the club is proud to nurture young talent, its number one focus is on keeping kids playing sport. “We’re not out to win flags. We’re out to get kids playing and enjoying football. Whatever we can do to keep families involved, we’ll do it,” he says. To that end, Tuggeranong Bulldogs has this year brought in a scholarship to assist players from disadvantaged families. “Gai Brodtmann sponsored the club with some money and we’ve used that to provide scholarships for kids whose families otherwise wouldn’t be able to afford it. We give them rego, shoes, socks and shirts and try to get them involved with the club as much as we can,” Richard says. The Tuggeranong Bulldogs Junior Football Club will celebrate its 40th anniversary on Saturday 8 August with a gala dinner. All past and present players are welcome. “We’d love to find the Bulldogs of old and have them come along to the gala dinner. I’ve been involved with the club for 15 years and I think we’ve managed to track down a few people, but there are others who were involved well before then too. That’s who we’d like to open the event up to as well,” Richard says. The venue for the gala dinner is still being finalised, but if you’re interested in celebrating the club’s 40th year or would like to organise a table, email tuggbulldogs@bigpond.com. Social media: Find Tuggeranong Bulldogs on Facebook. This is a new weekly series profiling Canberra sporting clubs. To nominate your club for an upcoming profile, please email amy@the-riotact.com.